Home > Divisions > U.M.P. 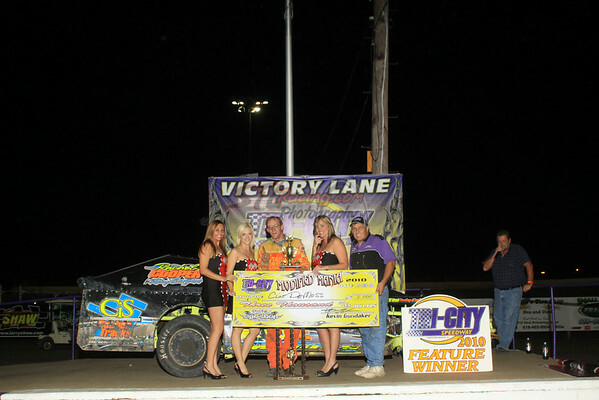 Modifieds > Clint Demoss takes Modified Mania Opener at Tri-City Speedway! Clint Demoss takes Modified Mania Opener at Tri-City Speedway! Pontoon Beach, IL (September 23rd, 2010) Clint Demoss powered his way to victory at the opening night of the Modified Mania at Tri-City Speedway. Mike Harrison took the lead on the opening lap as jumped out front of pole sitter Chad Kinder from his outside front row starting spot. Harrison would pace the field for the first sixteen circuits of the thirty lap main event before Demoss would slip past on the low side. Then a great three-way battle for the top spot developed as Demoss & Harrison were joined by Michael Long. The three raced three-wide for two laps Demoss would edge back out front and Long moved into the second spot. Long would pressure Demoss for the lead until he began to lose ground in the final three laps. Demoss would take the win and Long would finish second. Jared Landers fought past Harrison to finish third while 2010 Tri-City Speedway Modified Champion Rick Conoyer would rally from a sixteenth place starting spot and also get by Harrison to finish fourth. Harrison would round out the top five.